We all know the struggles of the morning rush – you snooze the alarm 5 times and then have to shower, get dressed, eat breakfast and speed out the door in 20 minutes flat. So, what if you leave a few lights on? It can’t make that much of a difference, right? If you’re still using the old 60-watt lightbulbs in your house, you should know a couple of things: The average 60-watt lightbulb wastes up to 90% of its energy as heat – that means only 10% of its energy is spent actually producing light. 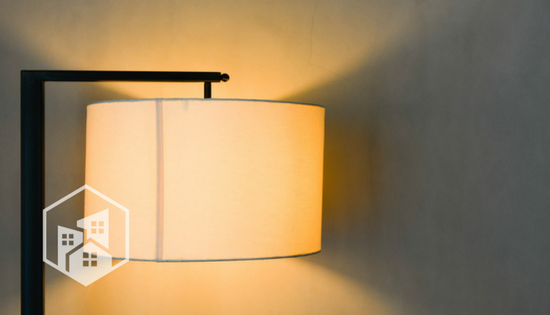 If that huge waste of energy isn’t enough to convince you to switch to LED bulbs, then here’s another reason: Leaving your lights on an extra 8 hours a day adds up to a waste of $900 a year! Yes, you read that right. So, instead of spending $900 to light up an empty house, why not use that money for a luxurious 7-day Caribbean cruise for two? Leaving your LED lights on all day isn’t quite as costly, but it’ll still cause a significant dent in your annual energy bill. 45 LED lights left on while you’re at work will cost you an extra $180 a year. That means, if you flip those switches off when you leave, you could save enough for an annual gym membership. Your home office is another big energy waster. If you switch off your laser printer, Wi-Fi and desktop computer every time you leave the house, it adds up to $216 in annual savings. That money could buy you an extra 54 Starbucks lattes a year. What could be better than supporting your caffeine addiction and saving the environment at the same time? Nothing. 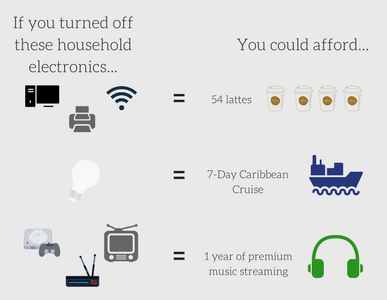 When’s the last time you turned off all your living room electronics in the morning? Yeah, we can’t remember either. But unplugging your game console, DVR, cable box and more can earn you $125 in annual savings, which could pay for a year’s worth of premium music streaming. It’s easy to overlook the little things with the hustle and bustle of everyday life; but the truth is, the little things can add up to a lot of savings for you and your family!